When it comes to first-person shooters, developers need to have a fairly solid hook these days to get make sure your game doesn’t become a victim of the overcrowded genre. Just look at the World War II games which once dominated the stores. With a few possible exceptions, there probably isn’t a single battle that hasn’t been in some way recreated in a video game — maybe the Nazi’s invasion of Belgium, but that would likely be a very short game — and so that particular type of game has become much less common over the last year or so. No, you need to really come up with something new these days in order to excel. You also need a solid multiplayer that also needs to have some innovations to set it apart. Publisher THQ and developer Kaos Studios (with help from Digital Extremes, who handled the PC port) have done just that with Homefront. The story is original and compelling, plus it is among the few video games that might be able to illicit and honest emotional response from the player, and the online side features a handful of innovations that promise to steal hours and hours from gamers’ lives. But even with all that gravy, a handful of glaring errors and problems are like an anchor around the neck of this game that stop it from achieving the greatness that it could have–and should have–had. Maybe it needed more development time, or maybe it was in trouble from the beginning, but at its core, a fantastic game is hidden under the problems. Homefront‘s plot was written by John Millius, the man that wrote Red Dawn and directed Conan the Barbarian, and he does his job admirably. Sure, you could argue that any invading force would be met by the lead embrace courtesy of the 2nd Amendment, and sure you could argue that North Korea, as insane and scary as the country is, would have to undergo a fairly radical transformation before it could feed its people, let alone invade America, but the game offers a plausible path to that dystopian future. It may be unlikely, but it is possible, and Homefront makes a compelling argument for it. You might think that it is just a video game, “Why bother worrying about the details?”, but this story is defined by the details. It wants you to buy into the setting. It needs you to feel the oppression. It desires you to share the rage of the characters. And it does all those things well, from the opening scenes of brutality where parents are murdered in front of screaming children, to scenes of mass graves that drive one member of your party to a near psychotic rage. The invasion is just one part of a dark and depressing future that includes a war in the Middle East and escalating oil prices which lead to a financial meltdown at home. These moments are hinted at by the characters, but scattered intel offers news-style glimpse at the events that are theorized to occur between now and 2027 when the game takes place. It paints a poignant — and very dark — picture. But the setting is just assumed when you begin the game. The KPA (Korean People’s Army) are a world power under Kim Jong-un, and the battered shell of America — which was already crumbling when an EMP preceded the invasion — is in ruins. The occupying forces have had two years to reinforce their territories, and everything west of the Mississippi is a potential Korean province. Despite the unifying nature of an occupying army, not all Americans share your thirst for victory. You will not only be forced to fight the KPA, you will be put in conflict with surviving Americans who have becomes somewhat unhinged by their reality, and are happy to exist in a violent bubble of their own making. In the future of Homefront, few resources are more valuable than gasoline, and when the game begins, you take the role of Robert Jacobs, a helicopter pilot who is rescued by the resistance to help steal a shipment of gasoline that could fuel a counterattack. Beyond the fact that Jacobs is a pilot, and with the exception of a handful of dialog, Jacobs is not much of a character. This seems to be a deliberate decision to put the player in Jacobs shoes without influencing your point of view through the motivations of a particular character. Rarely has a game put you in a situation where you will feel so uncomfortable so often. The familiar world takes on a twisted slant as you battle through suburbs and department stores where you can’t help but feel a familiar pang of recognition. Innocuous and innocent locations like baseball stadiums will be horror scenes filled with countless bodies. Don’t play this game expecting to walk away feeling uplifted, but if you are looking for a mature and compelling story set in a possible future, Homefront is the game for you. There really hasn’t been anything that is even close to it in terms of story. It tries to make you feel for the people and events, and as far as a video game can make you feel a true emotional response, Homefront succeeds. The people of the future are desperate survivors of the occupation, and the majority of your time will be spent with a handful of resistance members: Conner, Rianna, Hooper and Boone. Each character has their own history and reacts differently to the events you witness, and through them you learn about the state of affairs. As far as the characters and characterizations go, Homefront is a huge success. Some may not like the taciturn lead character, and some may not be in love with Conner’s “all anger all the time” personality, but that will be a matter of taste, not a fault with the game. Where the game does begin to show its flaws is in playing with your teammates. Throughout the game, you will almost always be with at least one AI-controlled teammate, and that can be a problem. Conner will frequently give directions on where to go, and these directions will usually lead to your slaughter. He will also find the best and most strategic location and hog it. If you try to share, the game will force you out and into a hail of gunfire. And while he is in this position of dominance, he and the rest of the AI will apparently be so ammo conscious that they will rarely make much difference when enemies are nearby. Now and again they may be forced to actually hit an enemy, but it is rare, and they will never throw grenades. This is a minor concern, but it is odd to have you rely so much on your teammates to progress — opening doors for example seems to be beyond the comprehension of your character — yet have them do so little in combat. Once you understand that your teammates are more or less useless though, you can act accordingly. Just don’t listen to them when they shout for you to rejoin them on the other side of a street guarded by robotic sentinels. You will die cursing them. 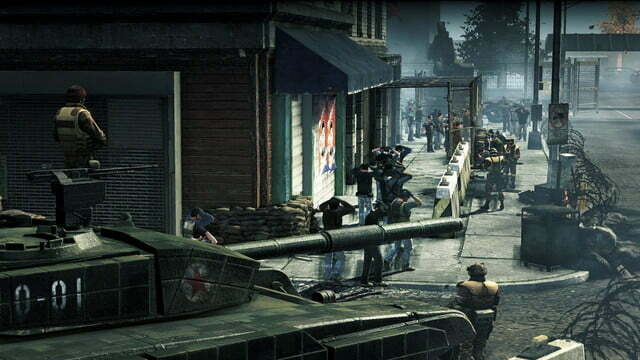 While the story of Homefront may feel fresh and original, the gameplay will feel very familiar. The game borrows heavily from the controls and movement that Call of Duty has made standard, and that is not a bad thing. There are a few minor issues though. For instance, despite cloning Call of Duty’s controls (and many others that also use the same style), Homefront offers fewer options. You can’t easily climb through windows, and there is never an action prompt to help you over obstacles. The lack of a true cover system is also notable, but not really much of an issue. The weapons are also very familiar, despite the futuristic setting. There are a handful of original firearms, but for the most part all the guns are the same that you will find in any modern day fighter. The M-16, M-4, SCAR and a few others will appear in the game, which feels like a missed opportunities to introduce some truly wild and original weapons. That being said, the sound and feel of each gun is very well done, and once you get a sense of each weapon, you can tell the difference on how each one will react when fired. In general, a few new touches or innovations would have been nice. It won’t prevent you from enjoying the game, but it does take away from some of the potential of the title. It is a sad and growing trend these days that single-player campaigns seem to be getting shorter and shorter, especially when the game offers a robust multiplayer. Homefront is no different, and while the story is compelling, the game is short. Very Short. On your first play-through under a normal level of difficulty, you can probably beat the game in under five hours. If you played it on easy, once you knew where to go, you could probably beat it in around four hours or less. If you are not a fan of playing competitive games online, then Homefront will not be worth your money. Thankfully though, the multiplayer is worth the price. 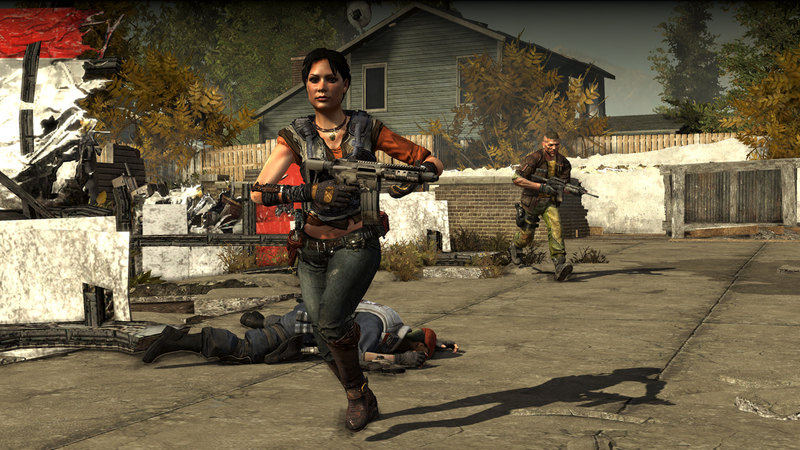 While the story of Homefront might be the draw, it is the online multiplayer that will make this game a success. There are really only three types of game modes (with three others offering the same modes in a different way), and just six maps, yet the game is fiendishly addictive. The hook is the “battle point” system, which is separate from the experience that you will gain throughout to unlock weapons and abilities at certain levels. When you begin a game, everyone has a handful of points to spend on special abilities. As you accomplish objectives — killing or assisting in killing an enemy, capturing a location, destroying an enemy vehicle, etc. — you earn points. With those points you can purchase things like body armor or a rocket launcher almost immediately, or you can save them to spend them on things like vehicles, air strikes and UAVs. It is a simple, and somewhat brilliant way to keep each and every game feeling fresh, and to make sure that there is a balance. If your team is losing, simply save up your points and call in an Apache (which you control) to help even the score. If the opposing team is rolling through you with tanks, buy some rockets to take them out. It is a new take on the killstreak idea, and one that means anyone can save up their points (they do not carry over between matches) and help their team win. The game modes themselves are ground control, team deathmatch and skirmish. Ground control is a territory-based game where up to 32 players fight to hold three locations. The deathmatch is what you would expect with up to 24 players, and skirmish is a mix of the two gametypes, but with up to 16 players. There are also three additional modes called the commander games, which are the same as the three regular game modes, but with a twist. Throughout the game, in addition to the primary objectives, your AI commander will assign targets to you based on their effectiveness. So, if an enemy near you is on a killstreak, you will be notified of their success and a battle-point bounty will be put on them, plus the area they are in will appear on your map. If you fail, other hunters will be tasked to help and the bounty will increase, or if you succeed, you reap the points. It is a fairly minor addition, and yet a great one as well. The multiplayer does, however, suffer from a lack of map variety. There are just six maps, and while they open up as the game progresses, ala the Battlefield games, even so the maps are not that big. They are also somewhat generic. Expect several more downloadable maps in the future… for a price. Despite the lack of variety in the multiplayer, the game is addictive. The battle points are a nice touch that take an old idea and make it feel fresh and original. There are plenty of unlockables as well, so you can expect to play Homefront for a long time. The use of dedicated servers is also a welcome inclusion, and means that dropped games and lag are kept at a minimum. For as many things as Homefront does right, it does a few critical things poorly. The most notable issue is the graphics. I reviewed the PS3 version of this game, but I have also played a few hours of the Xbox 360 version, and while neither is going to stun you, the PS3 version is noticeably worse. It feels as if the game was developed for the Xbox 360, then hastily rendered for the PS3 — although that is just a guess. The game also suffers from severe aliasing issues on both systems, but more so on the PS3. Aliasing is a visual issue that is more common on SD than HD video thanks to innovations in anti-aliasing technology that is standard on most games these days. When you are playing a game (or watching a video, but it is more obvious in games) and you look at a light post in the distance, thanks to anti-aliasing, that post is a straight line. 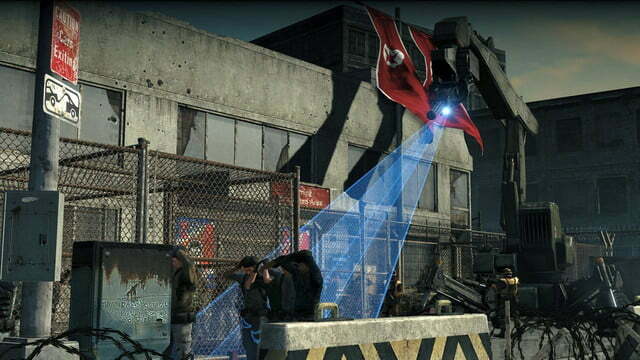 In Homefront, the aliasing is so bad that the light post seems to be broken into segments. Picket fences also blur, and even the lines on your gun appear to be several lines instead of one smooth image. The artwork in Homefront is solid, just look at the images above, but the problems with aliasing are a nearly unforgivable technical glitch, and it is something you will have to get used to rather than overlook. It almost single-handedly stops Homefront from being the amazing game that it could have been. The story of Homefront is among the best in recent years, at least in the sense of realism. It is a dark and mature plot that demands your attention, and offers a bleak look at a dystopian future. Many games have attempted the same thing, but few have succeeded as powerfully as Homefront, and very few games can even come close to matching the emotional cajoling this game attacks you with. You will want to rage at the enemy, and you will understand and sympathize with your computer controlled AI when they lose it and just begin to attack everyone they see. But even though it is immersive, the campaign suffers from two major problems. The first is that the campaign is very short and you will be left wanting more, and not in a good way. The final stage is fairly amazing, but there is very little resolution, and by the end you will be underwhelmed. It feels like the most amazing first part of a game never made. The second issue with the graphics is almost unforgivable. The gameplay is good enough that you will move past it, but it instantly make the game go from great to average. Five years ago this could be ignored, but with games like Crysis 2 coming later this month, and Killzone 3 now on the shelves, Homefront feels like a game from the last generation compared to those titles. If you are going to pay $60 for a game, expect more. The biggest issue with Homefront is that you know there is a great game in there. With just a bit more work, it could have easily been a game of the year contender, but it feels rushed. Homefront is still a good game. The story is compelling, albeit short, and the multiplayer is fun and addictive. But in a genre so overcrowded with breathtaking titles both new and old, Homefront fails to live up to its potential.